Most of the people who today are saying that they expected this are lying…to themselves. They are not trying to pull the wool over your eyes; they have pulled the wool over their own. They extrapolated out for several more years the rise from $50 in January 2010 to $304 on July 2011. They envisioned what they would do with the proceeds of a sale in 2015 of their 100 or 1,000 shares when the price of NFLX reached $7,000. So, paying six times sales in July was as natural as breathing. If you think it is easy being short a company like NFLX, then were you? An analyst as thorough as there is and an experienced short seller—Whitney Tilson—could not hack it. It seems he could not stand the day-after-day upward momentum in this stock, often in large chunks, and he covered his short earlier this year just a few months after writing an excellent piece on why NFLX was a great short. I am beginning to firmly believe that contrarianism is something that one is born with or seriously conditioned for at a young age. To be a good short seller, one has to have contrarianism in their DNA or their brain needs to be wired a certain way early in life. I have attached a chart of NFLX’s price movement. The numbers are staggering to me, it had a momentum all its own. If you were not short in this period but today believe the 75% drop was inevitable, try to imagine what it was like at the various inflection points in this chart before July 13, 2011. This entry was posted in Uncategorized and tagged Behavioral Finance, CFA Institute, Competition and Strategy, Conventional Professional Investors, Financial Media, Invisible Hand, Long-Short, Margin of Safety, NFLX, Risk, Short Sales, Whitney Tilson. Bookmark the permalink. Great post. Congrats on your short. This is another good video, but this time, where Cramer admits got it wrong. Great short. Although, you elide where you covered the other portions of your short, stating only when you covered the last of your short. Care to illuminate on that, in the interest of full disclosure? Did you cover some of it at a loss in late July or in August? If so, what percentage? I try to stay away from situations like these. Echoing Keynes, the market can remain insane longer than I can remain solvent. Glad that you won; it means you sized you position appropriately, and that’s a skill that few have, even at many well-known hedge funds. Hi there, well, I was one of the Netflix shorts but have a few BUTS to add….I shorted it at $184 and then watched it ride up to more than $300. I was convinced my analysis was right but started to sincerely doubt myself..but I hung on, which wasn’t easy as it was the largest position in my portfolio. That said, when the stock started to plummet, I got out at $150. So I made a nice 18% return in a little more than a year but what a tough year. My question for the author is the same as another poster: what were the increments you got out at? I found it very difficult to hang on for longer than $150 because the Street manipulates everything and I was afraid they could just as easily cause the thing to soar again. Where did you find the courage and conviction to hang on to $78? As the chart highlights, I reached a self-imposed purchase limit on my last purchase in Oct 2010. I find strict purchase limits are important for staying power. The position almost doubled from there and that was as far as I wanted to go. I contemplated easing off some at the next significant drop. When it hit $200, I covered one-third at a loss. I covered the second-third at $110 at a gain. Like you and others, I was convinced I had the analysis correct, but that did not make it easy. My point of posting this experience was not to say I was right, but to demonstrate how difficult it is to short even when you are sure you are correct. 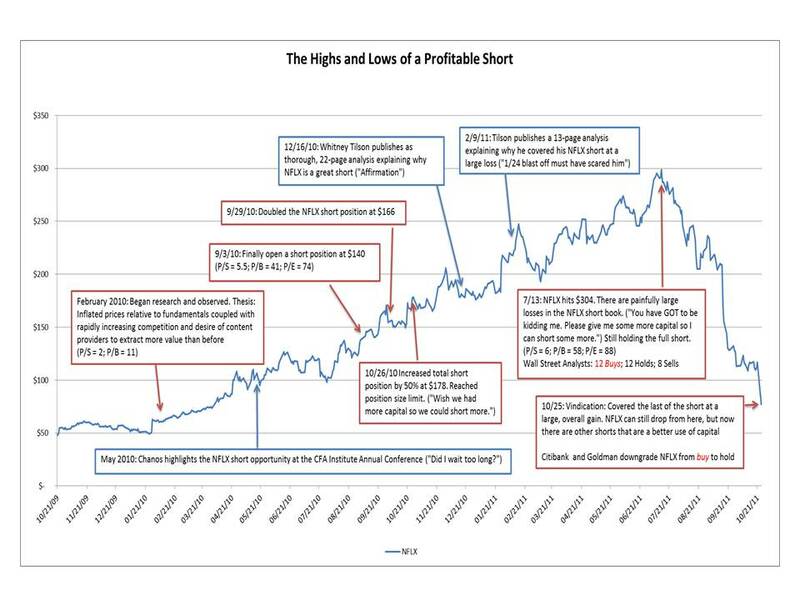 Lee S. Ainslie III gave a speech at a CFA Institute Hedge Fund Management Conference in 2002 in which he outlined all of the difficulties of going short. Given the odds against shorting success, one has to be good at risk management in order to pull it off successfully. I think you cannot pull the trigger on just an average-chance opportunity. It has to be a highy likely, asymmetric opportunity. In my opinion NFLX was that.